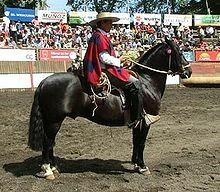 Chilean Corralero horses are related to Spanish horses that brought to Peru by the Spanish conqueror Pedro de Valdivia in 1541. In 1557 Garcia Hurtado de Mendoza, the new governor, arrived in Chile with 42 horses of the famous caste of the Guzmanes and Valenzuelas, marking the beginning of the Chilean horse breed. A pure Chilean breed appeared by the beginning of the 19th century, and the Chilean Corralero appeared by the end of the 19th century. They are the oldest registered Native American breed, the oldest registered breed of Iberian origin, the oldest registered horse breed in South America and the oldest registered stock horse breed in the Western Hemisphere. First they were used by the Spanish conquerors for war and for agriculture. When Chile got its independence, horses were an indispensable partner and used daily; in war for the Army, in the plantations for the countryman and for transportation for everybody. Chilean horses also have major ties in use for working cattle and are now used heavily in Chilean rodeo, which had its origins in the countryside as a game of chasing cattle. It is in this modern event that the Chilean Corralero shows all of its abilities. They are found in Bay, black, chestnut, gray, palomino, buckskin, and smoky gray.